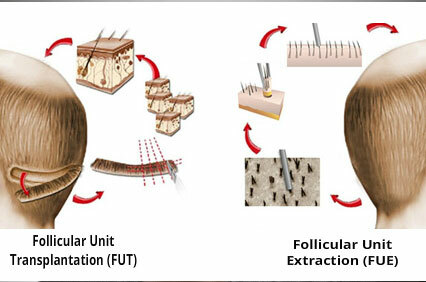 FUE Hair transplant in Singapore is available for men and women. FUE stands for (follicular unit extraction, or sometimes referred to as follicular unit transplantation) is a type of hair transplant surgery that involves extracting individual hair follicles from a donor part of the body, usually the sides and back of the head. These individual follicles are then implanted in the areas that are affected. Typically, with the men suffering from male pattern baldness this will be the classic horseshoe area. During the process, individual follicles – typically between 1 and 4 hairs – are removed under local anaesthesia. The extraction procedure utilises a micro surgical extraction instrument, between 0.6mm and 1.0mm in diameter, to remove the follicles. The surgeon, using specialist micro surgical needles, then punctures the scalp area that is to receive the grafts. Our surgeons are experts at blending the hair in, inserting the grafts at an angle and density that matches the original hair, so it will resemble a natural and realistic hair pattern. An FUE hair transplant can be undergone in either one long session, or several smaller sessions. It tends to be more time consuming than strip surgery, but does not leave the obvious and typical scars that strip surgery does. Unlike strip surgery, FUE hair transplantation does not require large areas of the scalp to be harvested. There is also no linear incision on the back of the head, nor does it leave a linear scar. As individual follicles are removed, it only leaves small, puncture scars, which are practically invisible to the naked eye. There is hardly any post-surgical pain and discomfort – with the average recovery time being less than 7 days. How long do results last? Once you have undergone FUE, the results are permanent. While the initial transplanted hair will shed a few weeks after treatment, it will grow back strong and healthy.